AAF Aeronautical Chart Mekong Delta. 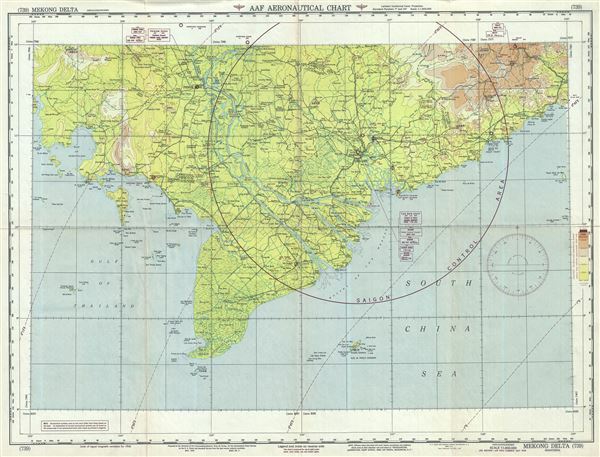 This is an uncommon 1949 U.S. Army Air Forces aeronautical chart of the Mekong Delta, Vietnam. It covers southwest Vietnam and southern Cambodia from the Island of Koh Rong in the Sihanoukville province of Cambodia, east to Phan-Rang Thap Cham or Panduranga. It identifies Saigon or Ho Chi Minh City as well as the capital of Cambodia, Phnom Penh. The map is highly detailed, noting important cities, towns, rivers, roads, forts, bridges, railroads as well as other hydrographical and topographical features essential for the air pilot. This chart was prepared for use at night under white, ultra-violet, red and amber lights. Verso features legends and a World aeronautical chart index. This chart was prepared under the direction of the Commanding General, Army Air Forces, for the Aeronautical Chart Service by the U.S. Coast Geodetic Survey. First issued in 1945 by the U.S. Coast and Geodetic Survey, Washington, this is the 5th edition. Chart no. 739. Very good. Minor wear along original fold lines. Text and map on verso.